Fort Worth Personal Trainer: How Janet Lost 25lbs, a Dress size, and Did a Triathlon in Her 60’s! Janet is a busy Wife, Mom of 3, Grandmother, and full time nurse in her 60’s. 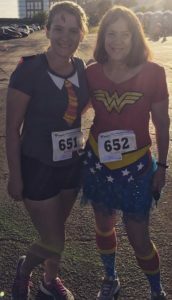 She’s not just keeping up with her grandkids she’s running 5k’s with her daughter and participating in triathlons for the first time in her life. She tells how she first joined our fitness boot camp to support her youngest daughter who had gained some weight in her first years as a school teacher. Even though her daughter got another job and moved away, Janet enjoyed the workouts and community enough to stay. She also shares the # 1 thing she eliminated from her diet that had the biggest impact on dropping those 25 pounds. Janet points out in the video and I think it’s important to note that she had been going to a health club, doing cardio, and group classes religiously for years and had never lost weight or really left her comfort zone outside of the gym. Getting into a fitness camp with other like minded people, focusing a little more on nutrition, and having a coach to encourage you makes all the difference in your enjoyment and results. If you’re in your 40’s 50’s or even 60’s and you have no idea how to start we’re offering a Beginners Fitness Boot Camp now. Designed with the beginner who’s hesitant about getting into a program because you think you need to be in shape already when you get here. We say “Come as you are”.